In August, I wrote an article on how you can translate Corsi differential values in terms of the average expected goal differential given for a players of similar average ice time. For example, Matt Halischuk and Eric Tangradi are two players who averaged 4th line minutes on the Winnipeg Jets. Tangradi finished the season with a 53.9% Corsi, while Halischuk was at 44.0%. Over the span of a season, forwards with those Corsi% would be expected to have on average of -1.04 and a -4.77 goal differential respectively. Therefore, on average, a 53.9% Corsi fourth line forward is worth 3.73 goals more than a 44.0% Corsi forward. Another option is comparing these players to the 46.8% Corsi% of an average fourth line player. The goal differentials can then be used to estimate win values using Pythagorean relationships. 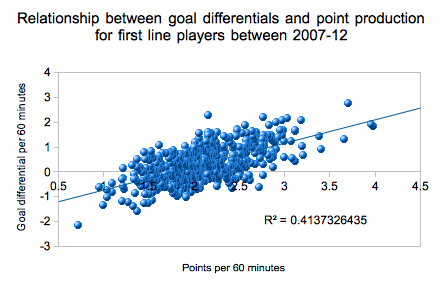 There is a caveat with using raw Corsi% to estimate goal differentials; all effects -such as zone starts- still apply. The estimated goal differentials would be no more predictive than Corsi is; however, you can now easily and more accurately measure Corsi impact in terms of goals and wins. Now, I used the example of Halischuk and Tangradi for a few reasons. The main one being that they are familiar to me as Winnipeg Jets players. They are two fourth line players that have experienced similar usage but have very polar opposite shot metrics. But, there is another reason… an interesting one.